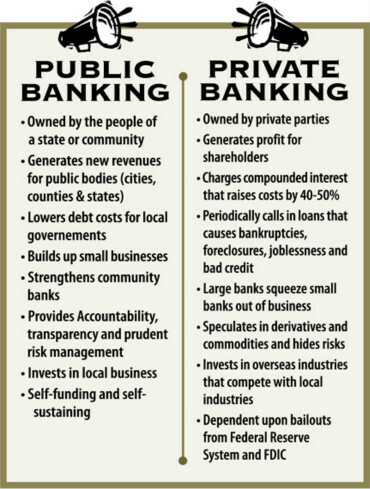 • The benefits of city-owned banks, county-owned banks, state-owned banks, and public land banks. • Why a banking system designed to prop up Wall Street’s too-big-to-fail banks doesn’t work, not only for people who have lost their jobs and their homes but for those who still have jobs, homes, and money to invest—and why public banking is the solution. Occupy Petaluma is hosting this event at the new Sunflower Center. Be sure to come early for dinner with the debate participents. Participants include Ernie Carpenter, former Sonoma County Supervisor, and Ellen Brown, author of Web of Debt. The question being debated is "Should Sonoma County Own A Public Bank?" More information here. 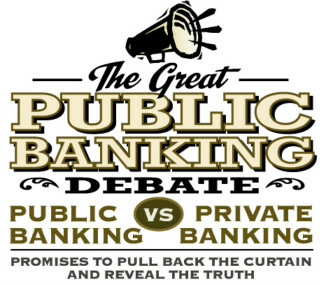 This debate will be on "Should State and Local Governments Own Public Banks?" Debate participants to be announced. This debate will be part of the NOW DC educational series. The Public Banking in America National Conference will feature this debate and will hold it at the Friends Center, at 15th and Cherry in Philadelphia. The question being debated is "Should the City of Philadelphia Own A Public Bank?" Your city/town -- it's up to you! 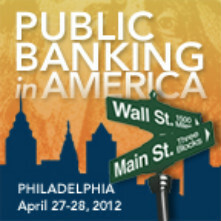 Participate in our weekly Public Banking in America Conference Calls and learn more about public banking!